Stories that Matter One Incredible God How could a pair of blue stilettos change someone else's story? Why would that story even matter? Everyone has a story.... the beautician at the beauty salon.... the homeless pregnant woman found sleeping in the park.... a pharmaceutical sales rep that appears as if her life is perfect.... the successful owner of a local waterline company.... or even a shallow-faced teen ravaged by the effects of drugs.... All of them have stories.... ....stories that matter. Inside this book there are countless real stories. Your faith will be encouraged as you read about how God speaks by sending butterflies after a night of sorrow, through catching fish, a timely delivery and the faith it took to build a ministry for those who didn't think their stories mattered. Join the courage of many that have found where their Hope Joy Peace and Freedom truly come from. 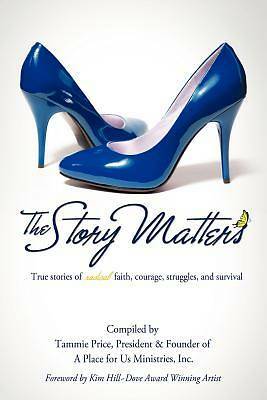 After reading these amazing stories you will be encouraged and uplifted knowing that God hears and answers prayer. He desires to become the Author of your story as well ....because your story matters. Tammie Price is the founder and president of A Place for Us, Ministries Inc. After finding herself pregnant out of wedlock, married, and then going through a heart wrenching divorce, she never imagined her story would matter and could be used for good. When she found the "Lover of her soul" through a real relationship with Jesus Christ, it became the turning point in her life. He became her everything; He would heal her brokenness and call a community to join in her efforts to reach out to the broken. A Place for Us Ministries was founded in April 2001.